No matter how much you Slack, e-mail or Hang Out, lasting relationships are better built in person. This is true for the relationship between Customer Success and Development, and even more so for the customer-relationship. Our development HQ is in Berlin, but 60% of our customers are in the US, and 3 out of 5 customer success agents live San Francisco. 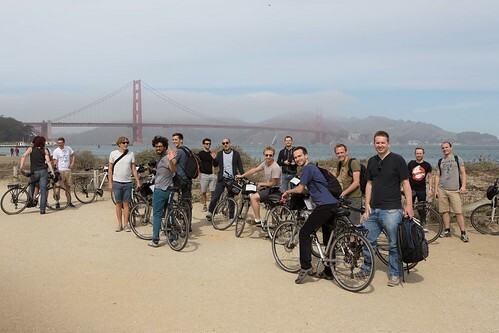 While most companies would merely fly out the product owner, the tech leads, or the marketing team, we decided that “cutting out the middle-man” would work best for us, and so we decided to send the entire Berlin office on a 10 day trip to San Francisco. Here’s how it worked out. Spoiler Alert: It worked out really well. Check out the video! We knew that the costs would be around $40k for a 10 day drip – no small price tag. Also, feature development would stall, both during the week and after returning (jetlag!). We’d have to plan this properly to make the most of those $40k. And so the general structure of the week was laid out upfront: Starting off with weekend shenanigans, Monday brainstorming, Full-week project-work in self-selected teams, and 8 customer visits. We hoped that cramming as much as possible into the working days would make the hefty fee worthwhile. We flew out on Friday and arrived on Friday. The weekend was reserved for touristy stuff, sponsored by the company: On Saturday we rented bikes to ride across SF and over the Golden Gate bridge, on Sunday we rented cars and drove down to Santa Cruz. Nobody had to join, and the locals (expectedly) passed, but the entire Berlin crew attended. Monday was reserved for brainstorming: If we could start the product afresh, what key features would we build first? We flew in Joris Luijke, an HR visionary of Atlassian and SquareSpace fame, to present to us the current state and challenges of HR. We brainstormed topics that everyone (from development to customer success) deemed important, and distilled 4 main topics that we’d love to build and which weren’t properly covered in the product. To ensure everyone had a clear goal, we set a fixed presentation date for Friday at 3pm. There was definitely a lot of tension during Tuesday and Wednesday morning, lots of discussions to be had, lots of “oh crap” moments, and back-and-forth on each team. It seemed that Wednesday afternoon was the turning point for the subteams, from then on people found their rhythm, and the presentations on Friday were all really inspiring. In parallel, we attended 8 customer meetings in groups of 4-5. We made sure every developer visited two customers. Thanks to random distribution, no customer-visit featured the same team of visitors, leading to lots of interesting discussions afterwards. Our customer visits happened in parallel to our brainstorming and project work, and influenced it heavily. Some would have preferred to have met all the customers up front – but then again, you can’t only listen to customers, you need visions and listen to your own heart as well. Even in hindsight I think this was the best way to approach it. First brainstorm, then launch projects, then validate projects with live feedback from clients in parallel. While 8 visits are not representative for our 650+ total clients, some trends emerged that had been somewhat visible in our support desk and inbound mails, and we’ve taken a lot of feedback and slotted it into our next 2-6 month plan. In fact, some major work is in progress already. Out of 14 Berlin attendees, a whopping 11 got together for a self-organised one-week-roadtrip from SF through Yosemite and Death Valley down to Las Vegas. The company didn’t pay for anything, and merely made sure that the flights back were from Vegas instead of SF. I wasn’t part of this trip either, so it can’t even be attributed to “CEO-pressure”, and the team emerged unscathed despite of 7 more days in 3 cars. The 4 topics we worked on will not make it into the roadmap immediately, because we still have a few things to wrap up by January. Starting February, a lot of the topics will resurface. Most likely we’ll dive deep into the 1-1-support issue, and most likely a large share of the “in-time-feedback” project will make it into our 360 module. And we’ll be slotting in improvements over the next 6 months for sure. So, was it worth it? Absolutely! Working efficiently is important, but working on the right stuff is even more so. Knowing who you build your feature for, and why, is key to delivering great results, especially for developers.